The top tourist attractions in Bosnia and Herzegovina are one and the same since they refer to the European country in the Balkan Peninsula. However, tourists usually just call it Bosnia. Like many parts of Europe, it has many historical treasures. The country also boasts natural wonders tucked in its mountains. Stari Most is a 2004 reconstruction of the 16th century Ottoman bridge that was destroyed in 1993 during the Croat-Bosniak War. It is considered to be one of the finest examples of Islamic architecture in the Balkan region. Mehmed Pasa Sokolovic Bridge is a historic structure located in Visegrad. It was designed by Mimar Sinan, Ottoman court architect of the Grand Vizier Mehmed Pasa Sokolovic to whom it was named after. It was completed in 1577 AD and enlisted as a UNESCO World Heritage Site in 2007. Sutjeska National Park contains Perucica, one of the last two primeval forests found in Europe. It also happens to be the oldest national park in the country. There are other sights to see within the park such as the highest peak of Maglic and the Sutjeska river canyon. Prijedor has several attractions in its midst. Carsijska Dzamija is one of the oldest mosques in Prijedor and top tourist attractions in Bosnia. It was built in 1750 and houses a library and school. Another must-see in the city is Crkva Svete Trojic, an orthodox church constructed in 1898 and is surrounded by a small park. Kozara National Park is a famous hunting ground. Hunting of ducks, boars, hares, foxes, deer, and pheasants in the area is regulated. For everyone else, there are safe places in Kozara for hiking, biking, and walking. Ostrozac Castle is a 16th century castle found in Una-Santa Canton, near Ostrozac village. Between 1900 and 1906, the castle was further expanded by an unknown member of the Habsburg family. Radimlja is a “necropolis” containing medieval stecak tombstones, most dating back to the 15th and 16th century. 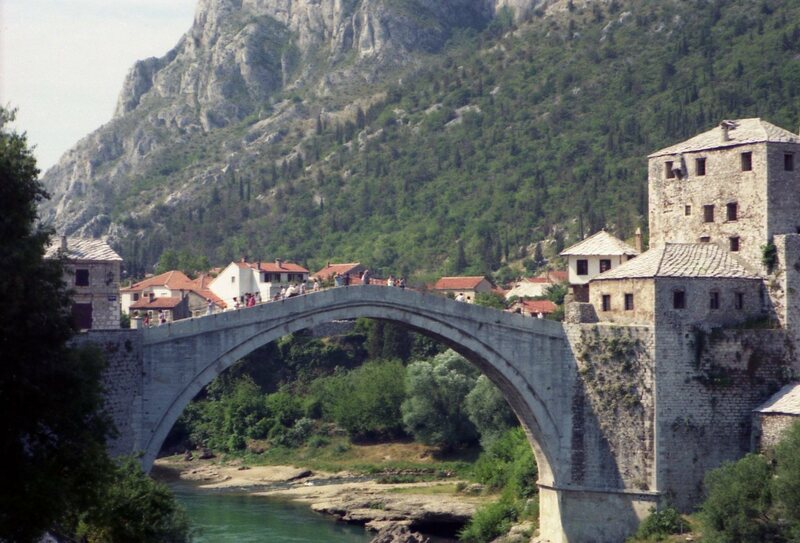 It is one of the top tourist attractions in Bosnia from the medieval era. Radimlja is located 3 km west of Stolac, in Vidovo polje. Mogorjelo is a fourth century Roman villa rustica. A beautiful park and horse farm surrounds it. Located nearby is a horse riding club. The club brings in more than 300,000 tourists every year since its opening. Lower Tara River Canyon is a continuation of the river canyon which originates from the Dinaric Alps in Montenegro. Together with the Upper Tara River Canyon, it is the second longest canyon in the world next to the Grand Canyon. It is protected by UNESCO as it is a World Heritage Site. Pannonian Lakes are the only salt lakes in Europe. They can be found in the multicultural city of Tuzla. Beach resorts and other entertainment facilities surround these lakes and attract more than 100,000 tourists each year.